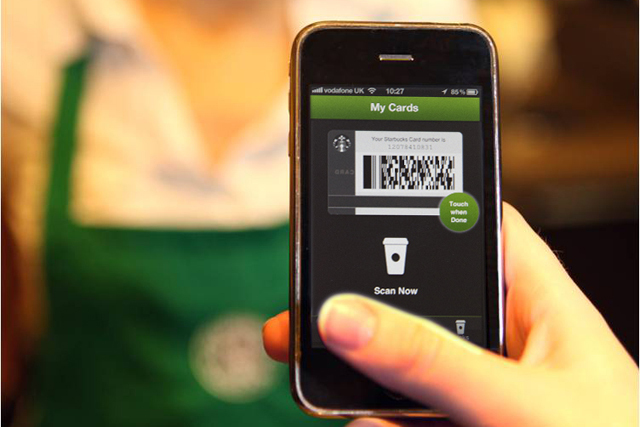 Starbucks, the coffee chain, is installing a mobile payment system in the form of an iPhone app into 700 of its outlets across the UK and Ireland, following a successful US roll-out. The Starbucks app will be available for iPhone and iPod Touch users from 5 January and allows consumers to pay for their items through their phone with the aim to reduce transaction time by around 10 seconds. Consumers who own a registered Starbucks Card, part of the chain’s loyalty programme, will be able to link the balance on their reward card to the Starbucks app. Each consumer with a reward card will be given a unique barcode that will appear on the app and can be scanned at the till. Starbucks first launched the app in the US earlier this year across 6,800 stores, which have since processed more than 20 million mobile transactions. Brian Waring, vice president, marketing and category, Starbucks UK and Ireland, said: "Customers want to be served quickly, but fewer want to use cash. "We wanted to find a way for them to pay in the quickest way possible. Because our customers want it, we have created our own custom-built mobile payment technology rather than waiting for the near field communication technology which is currently not widely available. "We're always thinking of new ways to add value to our customers and give them more reasons to choose Starbucks." Starbucks teamed up with Apple in October this year to launch a digital initiative called "Pick of the week", offering its customers a free selected iTunes music track or book to download.